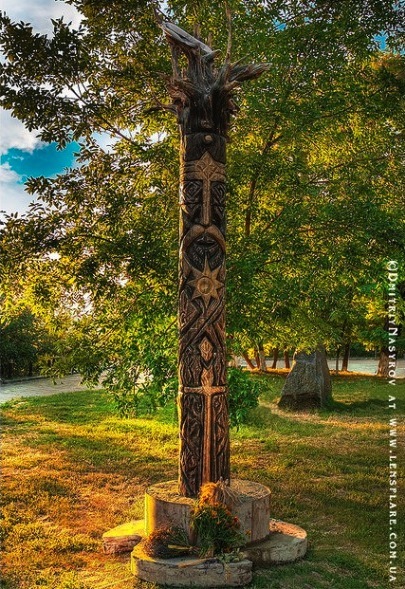 On August 24, 2009, in Kiev city center on Starokijovsko hill, a three metre high idol of Perun was built. The first time Perun “with a silver head and gold mustache” was built in the year 980 under order of Prince Vladimir, but, eight years later, after baptism was accepted by Vladimir, Perun was demolished. In 2009 a new Perun was carried on the shoulders of Ridnovir (indigenous religion) followers through the streets of the city. On the same mountain, the sacred fire was ignited in the old traditions. Many Ukrainian history lovers looked upon this event agreeably. However, the Kiev church openly expressed their dissatisfaction, while there has been more than one effort to stop the Ukrainian original faith’s (Ridnovir) revival. Recently, Greek Catholic activists attacked the old faith temple in the village of Sadzivko, it was destroyed and those who tried to defend it were beaten. Similarly, in 2007, Ridnovirs were attacked in the territory of the Kiev National Museum. News of aggressive action against followers of the old faith has been reported in Russia as well. This time Kiev’s Ridnovir had hopes that their sacred places and objects would not be touched. Unfortunately, this year, on November 1, the recently-built Perun sanctuary on Kiev’s Starokijevsko Hill was secretly demolished. This was reported by the Ukrainian leader of Ridnoviry, Halina Lozko, an eminent scientist, who has published a book “Rodzima wiara ukrainska.” Among other things, she participated in the Conference of Ethnic Religions, organized in Vilnius in 1998. Previous PostTHE REASONS WHY THE NOTION “INTERNATIONAL CRISIS” MEANS ABSOLUTELY NOTHINGNext PostCanada: respect constitutional rights of First Nations!